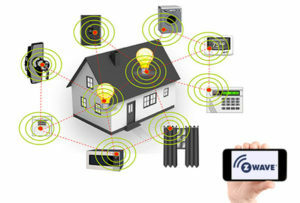 Z-wave technology is the heart of ADT and almost all home automation systems. Z-wave technology is the heart of ADT Command, ADT Pulse and almost all home automation systems. It is the technology that allows electronic devices to talk to each other and you. All of that communication happens reliably, without interference, without consuming a lot of power, and it all happens securely. 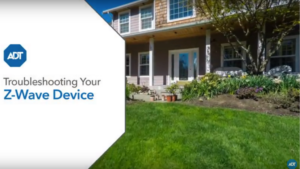 Using Z-Wave you are able to combine electronic devices into a network and have them all work together automatically, on an event, or on a schedule. It makes regular household items like a deadbolt, light switch, or thermostat “smart”. Connect it to either the ADT Command Smart Security Panel, or your ADT Pulse Gateway which is the Z-wave gateway that allows you to control all of these devices. WHAT IS Z-WAVE AND HOW DOES IT WORK? The Z-Wave protocol is an inter-operable, wireless, RF-based communications technology designed specifically for control, monitoring and status reading applications in residential and light commercial environments. Mature, proven and broadly deployed (with over 35 million products sold worldwide), Z-Wave is by far the world market leader in wireless control, bringing affordable, reliable and easy-to-use ‘smart’ products to many millions of people in every aspect of daily life. • Wireless – No cables or complex installation needed. Z-Wave uses a low-frequency, high range wireless technology. • Low Power – Both the battery powered and wired Z-wave devices use low power capabilities. • Interference Free – Unreliability can be really frustrating. Since Z-wave uses a low frequency and avoids interference with Wi-Fi, Bluetooth and other systems using the 2.4GHz band. • Mesh Technology – Wireless signals can get lost, but Z-wave signals do not because z-wave devices act as part of a mesh network, receiving, amplifying, and repeating signals intended for other z-wave devices. Because nodes (connected to power) act as a repeater, Z-wave can provide enough range for even the largest homes. Expandable – You can buy some devices today and more in a month or a year. The more you add the better your mesh network will be and the more devices you can control. Easy to Use – Anyone can add Z-wave devices to their ADT system and a professional technician is not required. Most devices have been designed to be easy to install so that it can be done with little help or instruction. 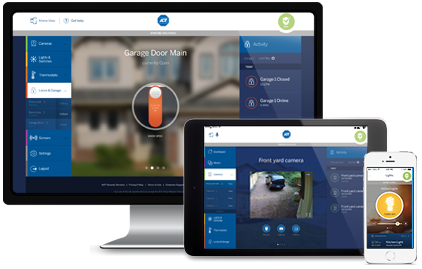 Secure – ADT would not mess with anything that would compromise your security. With Z-wave there are layers of security from device codes to signal encryption that work to help avoid breaches and interference. Z-wave uses industry standard AES128 encryption, the same protocol used in online banking.